How have we become the online leader for Shipping Labels? We have literally thousands of different shipping label designs. This is the largest collection of shipping labels and shipping tags on the web. One label does not fit all warnings. Each package is different. Choose the text that gives the exact instructions that you need. To make it easy to find the exact message, use our convenient online search to find a label with the correct text. It has never been easier to find the right HazMat placard or DOT label. Our innovative Placard Finder allows you to quickly enter your chemical and then automatically find the placards or labels specified by the DOT regulations. We help you cut through the regulatory maze. Our fluorescent and striped shipping labels are hard to ignore. Pictogram or symbol labels are easily understood – even by those that do not read English well. Sometimes, though, the best design is the simplest. The classic red shipping label with white letters, to many, is still the most conspicuous label when mounted on shrink wrap or corrugated. These labels are in stock and ready for quick ship. We use premium materials from the leading film and label coaters in the US. Our tag board HazMat placards are 20% thicker than the competition. The placard holders are the best in the market. Our removable vinyl and paper shipping labels stick aggressively, but can still be taken off cleanly. From economical wall-mounted units to the latest in electronic dispensers, our broad range of label dispensers is a proven way to organize your warehouse and speed up shipping procedures. Make it easy to apply the right label. Best Sellers at Best Pricing. Just compare pricing. 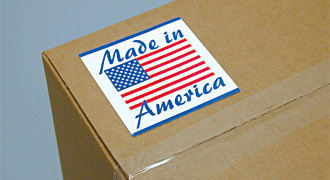 Our Fragile shipping labels, for example, are as low as $6.95/roll.